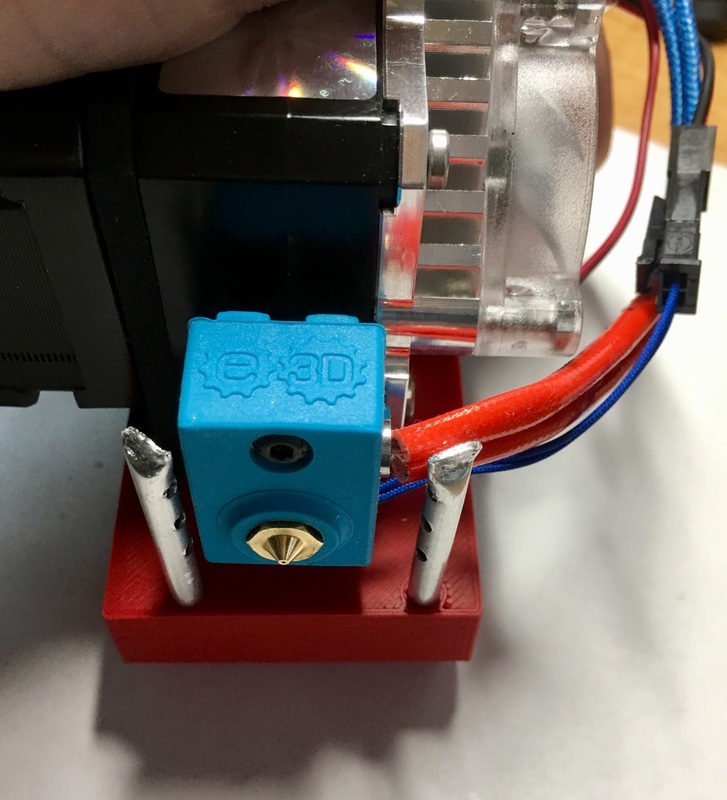 I just completed the first functional prototype for a Tusk part cooling shroud that fits the new UltiBots D300VS+ SLS Titan Aero extruder/hot end. This basic idea should work on any delta effector for the Titan Aero although you may have to think about attachment. Worse case you could super glue it on - don't laugh, super glue works great for this application! This Tusk one of the 4020 Blower Fans provided for part cooling on the stock D300VS or D300VS+. The Tusk is designed to blow 6 streams of air directly at the extruded plastic immediately below the nozzle. Each Tusk has 3 holes angled to converge on the nozzle top as you can see below. I've used a smoke maker and observed the streams to tune the position optimally and the Tusk does a remarkable job of surrounding the area around the nozzle with a directed stream of cooling air. The aluminum tubes are 4mm OD with .45mm wall thickness so the fan can easily provide the air pressure required - quietly and efficiently. I rarely run at 100% fan. Usually, 50% is more than enough for PETG and even less for PLA and ABS. The ends of the aluminum tube are crimped to align with the air holes so they can be used to tune/direct the air flow. The release version is here now posted on Thingiverse. 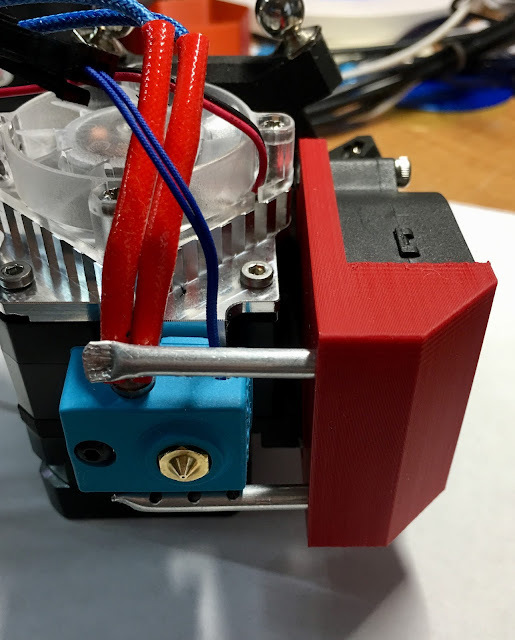 19 comments to ''Tusk Part Cooling for a Titan Aero and D300VS(+)"
I recently made up a tusk for my prusa I2. My machine is pretty well tuned in and gives me superb prints using kisslicer. I use two fans front and back. So I thought I would give the tusk a try. I designed my own duct keeping your tube crs dimension and using a 50x15 blower fan. I have run several test pieces and I still getbetter results overall from my 2 fan set up. However I would say my bridging is slightly better with tusk. But the pillars on the bridge test are definitely worse and undercooled as the nozzle moves away quickly to the other pillar about 50mm away. Don't want to give up on the tusk it has so many other advantages. How do you have the air flow directed from the 3 holes on each Tusk Philip? They should be aimed just slightly (.5mm) below the tip of the nozzle. Also, make sure you are getting air flow. With a 50x15 mm fan, you should be able to blow enough air through to freeze anything! Something is not set up correctly I suspect. I have everything lined up as accurately as possible. The centre holes are exactly in line with the nozzle and the aim is as accurate as I can get using a straight edge on the crimps. I made a new set of tubes with holes enlarged to 2.5 mm and this improved things slightly. I used your dimensions from the duct you previously posted with the centres of the tubes at 26mm. My next move is to redesign my duct with the tubes nearer the nozzle. And after that will try a 5 hole tube.. I was wondering if I had poor airflow through my duct which is about 35mm to the start of the tubes from the mouth of the fan, but itlooks quite flowing with curves and yours are pretty "square". I have been able to lower my print temp on this batch of pla by 5 degrees. Will let you know how the redesign goes. Ps. Is there anyway of posting images or stl files. No, Blogger doesn't let commenters post files but if you want to email anything to me, I can post it. I will email you my redesigned duct when I do it. I would appreciate your comments on it..
Have you had any feedback from other tusk users? Yes, actually, a lot of very positive feedback. 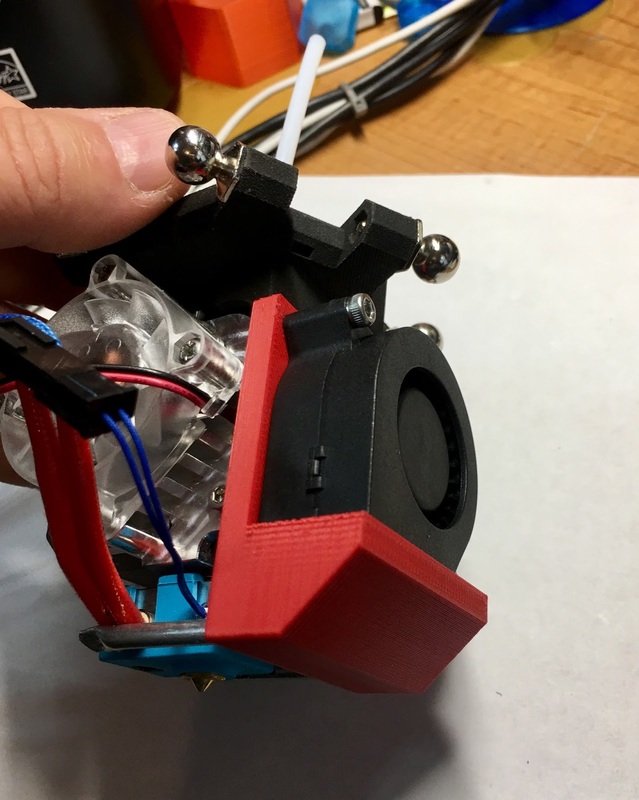 I think there are even some comments on the Thingiverse page as well as other places. 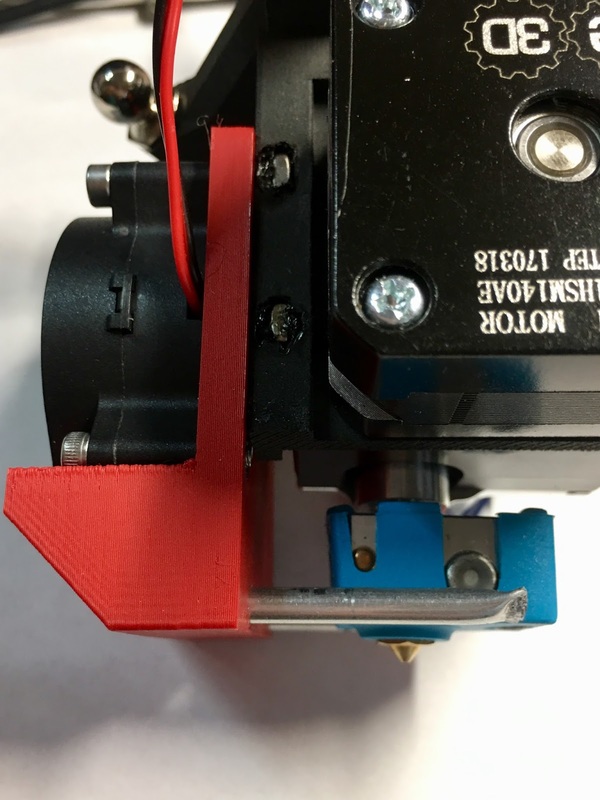 Several printer manufacturers have tested and are planning to release a Tusk based cooling system for their printers. I really suspect that you have a clog somewhere. Look at the BerdAir device, it has MUCH lower airflow than Tusk at full bore and everyone (including me) love its cooling ability. The only objection is that the air pump is incredibly loud (and requires care to interface to a controller like Duet). The Tusk uses a standard fan that is much quieter and with the larger tubes and air holes, allows much more air flow. Michael, are you using the larger Berd-Air pump? I find it is not very loud, even at 100% speed. I do like your "Tusk" design, I need to get one made to test it. Probably have both on same machine. Yes I am Brian and it is quite loud. Everyone I know with one has that common complaint. We're running Duet Wifi on our printers so the steppers are nearly silent so any noise is very obvious. Even with rubber mounts I find the pump too loud. Michael...I really enjoy the articles you've been posting. I just bought the D300VS+ and curious as to when the final release or STL's will be released for the tusk cooling? Also i'm curious as to the mounting on to the effector. Thanks for all the printing insight! It's now posted, see link in comment below. Hello are the files available for this yet? Also where to get the tubes or is there a quick substitute? I have some left over from berd air not sure if its large enough. Also curious to try out the files - I picked up some 4 mm tubing and a fan for this. Thanks for sharing this! You can get 4mm OD tube at most hobby shops and Amazon carries it. You can get seamed SS tube at McMaster Carr. I just gave this setup a try on a UltiBots Kossel 250 and unfortunately I'm getting barely any airflow from the holes in the tubing. I'm using the exact same ball-bearing 2040 blower from Ultibots, identical tubing and hole diameters, de-burred everything...still a fraction of the flow I get from my existing Berd-Air setup. The fan doesn't seal up to the opening in the printed portion of the Tusk so the majority of the air seems to just escape from there. Is this by design or did you forget to mention sealing the blower to the Tusk with RTV or something? I had my doubts a centrifugal blower would produce enough pressure for this, but if you and others are having success there must be something I've over-looked. Either that, or the slight draft from the tubes is sufficient and I'm just expecting too much compared to the VERY strong blast of air my Berd-Air is capable of a producing. Roger, I was using 25mm fans for years before this larger fan design. Believe me, this works perfectly fine. Did you block the huge hole at the top of the fan? I have no idea why they are manufactured this way but this particular version of fan has a very large opening that is venting your air. Block it up with a printed part or simply silicone seal and all should be well. That's where the majority of the air escapes. If you have sealing problems around the base, a little silicone will take care of that too. Finally, make sure there is no plastic support inside the fan shroud - test by blowing through the 2 tusks and feel for resistance. It is also true that with precisely focused air, you do not need a jet engine backwash. Even the Berd air full blast is WAY more air than I ever use. I typically have my Berd air pump turned down to 40-50%. But everyone, I just discovered this large opening in the top of this particular fan recently. I plan to design a printed plug. It certainly does shunt a lot of air as you can feel and hear it. The berd air is so noisy though.